Every manager has a story to tell. Find out how one management professional tackles a fictional dilemma. The story may be made up, but the solutions are tried and true. In this installment, Esther Derby tells you how to stop playing "Manager in the Middle" and get your team members talking. All code is not created equal. Learn from a master of the craft how to spot bad code and mold it into good. This month, Mike Clark explains how moving code from one class to another to make it reusable can save you time in the long run. Connect with an expert to learn how to work smarter and discover new ways to uncover more defects. In this issue, Michael Bolton continues his discussion of James Bach's Heuristic Test Strategy Model by introducing the Product Elements perspective on test coverage. Turn to The Last Word, where software professionals who care about quality give you their opinions on hot topics. This month, Gregory Pope offers alternatives to the dreaded "T" word. No one starts a project with the goal of failing, but some metrics experts claim that 80 percent of software metrics initiatives fail. Just as your software project has goals for success, you should have goals for success in your metrics initiatives. Find out what you can do to better your chance for success. Projects collapse in a variety of ways and for a variety of reasons. Fortunately there are things you can do to stabilize and rebuild your project before the dust settles. With these expert tips and a little elbow grease, you'll have the tools you'll need to renovate almost any failing project. 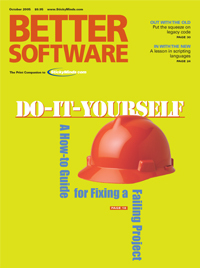 More and more software testing is becoming a technical activity—and that means programming. In the future, simply having domain knowledge won't be enough. Good craftspeople need good tools, and some of the most powerful tools in the tester’s toolbox today are dynamic programming languages like Perl and Ruby. If you aren't familiar with these languages, this article will help you get up to speed and start scripting in no time. Grandma cooked her roast a certain way, and now you're repeating the process without knowing why you have to trim the ends off an uncooked roast even though the pan is adequately sized. Relic processes in many organzations fall trap to this mindset since the reason behind the action lost its meaning long ago. Lee Copeland calls these "IF ..., THEN ..." processes. When the organization loses sight of the IF responsible for the action, then you're left with what Lee describes as "a process without a context; a rule without a reason." Get one reviewer's opinion of Selenium, a functional and acceptance testing tool for Web applications.